Intel brought a modicum of excitement to the small-form-factor space when it announced there were plans afoot to mate its impressive H-series mobile CPUs with graphics technology from AMD's Radeon stable. Such a processor, we thought, would combine the best of both worlds, and serve as a stopgap until the chip giant finalised its Arctic Sound GPU. Fuller details were released at the turn of the year, along with plans to put the 8th Gen Core G-series chips into a couple of NUCs packing real speed on both CPU and GPU fronts. 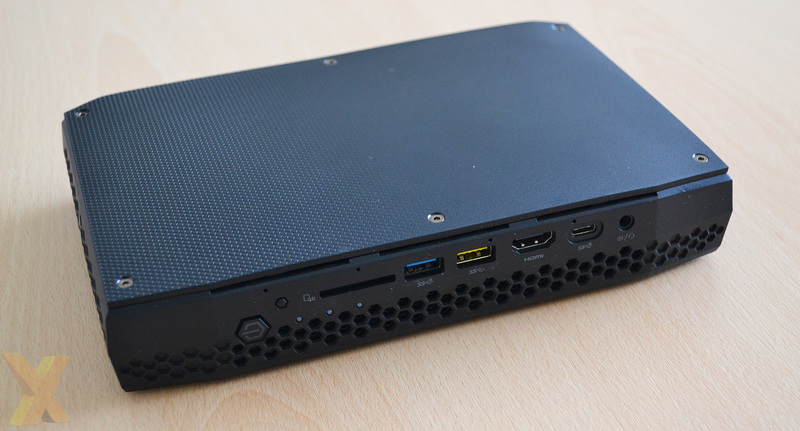 The NUC8i7HNK packs in the 65W-rated Core i7-8705G processor that carries 1,280-core Radeon RX Vega M GL graphics while the flagship model, NUC8i7HVK, uses the 100W TDP Core i7-8809G that amalgamates a 1,536-core Radeon RX Vega M GH SoC. We take a closer look at the latter, available for £830 in barebone form. Both are backed by a standard three-year warranty. 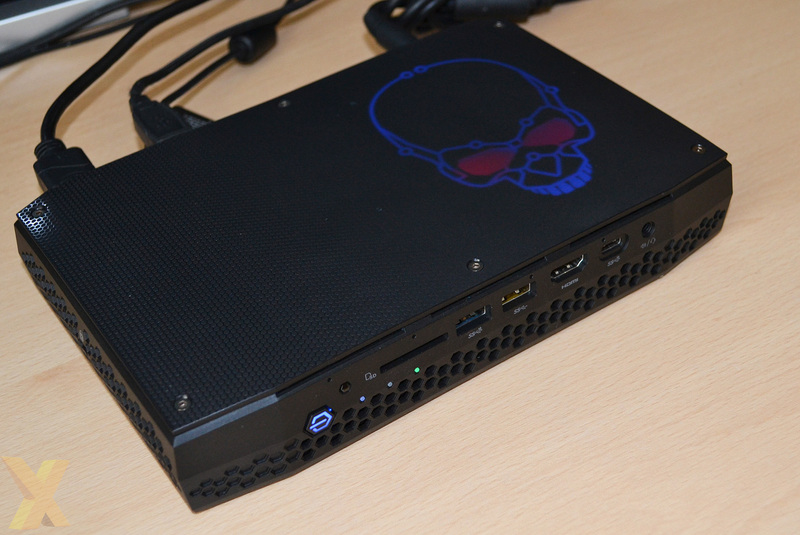 Codenamed Hades Canyon, Intel uses the two-year-old Skull Canyon as a design base but appreciates the newest iteration needs a bigger chassis, enlarging to 221mm x 142mm x 39mm, which translates to a form factor akin to a thick paperback book. 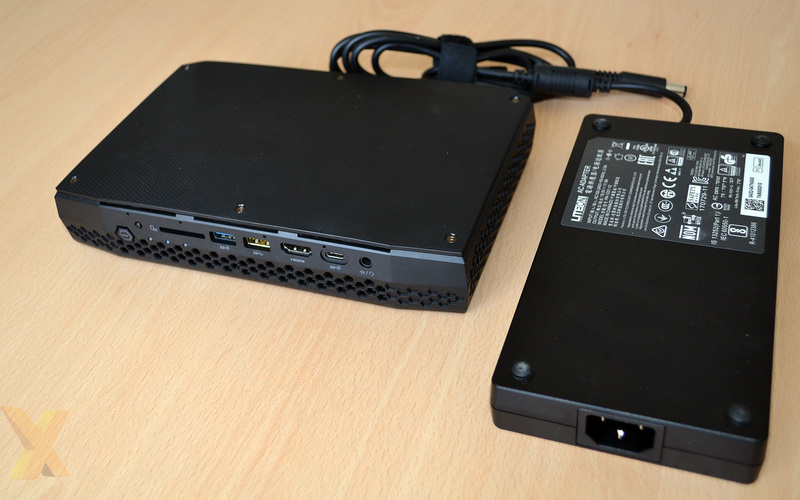 In fact, the accompanying LiteOn 230W fanless charger is almost as large. The duo weighs 1,290g and 905g, respectively, meaning that although not featherweight, they are easily transportable in a small bag. 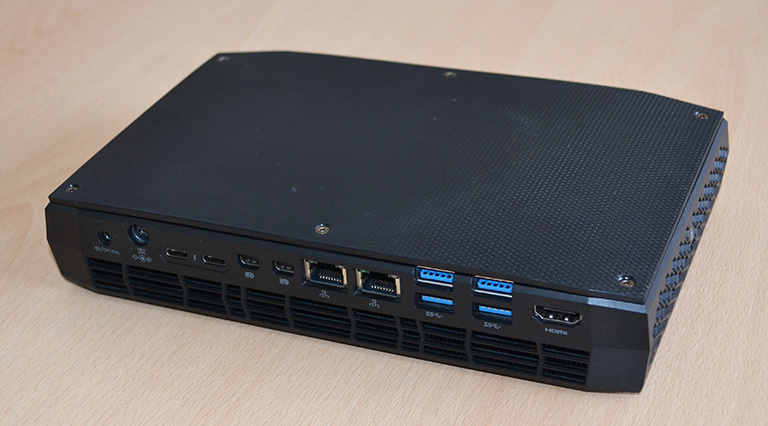 This NUC largely carries over last-generation styling, matching that model's honeycomb grilles, part-dimpled top section, and generous use of high-quality plastic. Build quality is excellent throughout, with no squeaks when gripping either the top or sides firmly. Six Allen screws hold the top plate in place, whose right-hand side is home to the ubiquitous NUC LED-lit Skull, and a fair bit of fun can be had configuring a multitude of effects through the OS-based control panel. If you wish, all LEDs can be disabled, but bear in mind that doing so also switches off all power/status lights. Going from left to right, there's a power button, infra red sensor, SD card slot, USB 3.1 Gen 1, USB 3.1 Gen 2 Type-A (yellow), HDMI 2.0a (ostensibly for VR duties), USB 3.1 Gen 2 Type-C, and headphone jack. That's a solid number of useful I/O, and Intel leaves enough gap between ports for easy disengaging. The reason for going heavy on the front and back rests with leaving the sides empty for much-needed ventilation for the internal heatsinks. A similarly comprehensive arrangement of ports on the back adds an optical-out, power inlet, dual Thunderbolt 3 ports, dual mini-DisplayPort 1.2, dual Gigabit Ethernet, a further four USB 3.0, and another HDMI 2.0a, which means that you can drive six 4K60 displays simultaneously. There's really little else that could have been added from a connectivity viewpoint. Intel enables you to get inside the Hades Canyon by bundling the relevant Allen key, plus a number of screws for a Vesa mount. Getting inside is obligatory, of course, as the unit is sold as a barebone solution, requiring the user to source their own operating system, SODIMM memory, and M.2-based storage - more on that later. 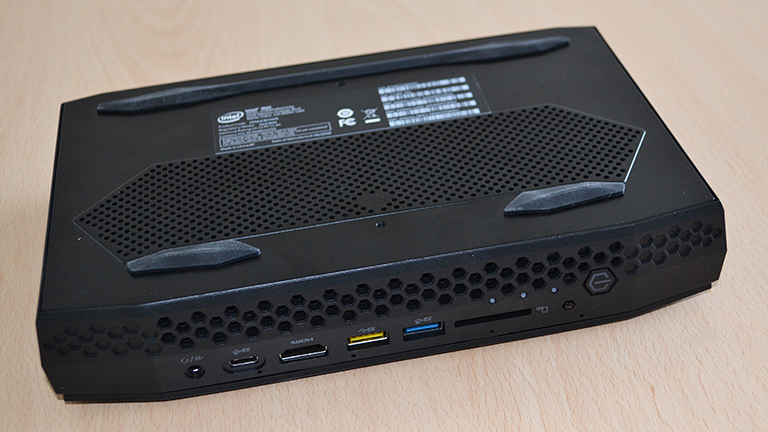 This NUC is sensibly raised a few millimetres to enable even more cooling. In operation and under load there's a steady stream of warm air coming predominately out of the sides and back, with less exhausting out the bottom. The chassis becomes warm but never hot, and thermal management enables it to be practically silent at idle - you can't hear it at a regular three feet away - while it's reasonably quiet under the pump. The good thing is that the pitch doesn't change much when full-on gaming or rendering, and whilst obviously noticeable, the aural output isn't annoying. We tested our unit placed behind a large 4K monitor, roughly three feet away from the chair, and got quickly used to the noise profile. Using the same methodology employed in our graphics card reviews, the unit produces 41.8dB when gaming. Removing the six Allen screws reveals the first part of the innards, dominated by the Skull lighting. Getting into the main bulk of the chassis requires removing a central Philips screw and then disengaging the cable providing power to the top lighting. The quickstart guide misses this step so novice users may be scratching their heads at this point, but removing that pesky screw reveals the ample guts of Hades Canyon, as shown below. A couple of M.2 2280 slots connect to the backbone of the custom motherboard and offer PCIe Gen 3 x4 interfaces each. Underneath the right-hand slot is another M.2, this time suitable for a 2230-sized WiFi/Bluetooth card. Hades Canyon uses the established 2x2 Wireless-AC 8265 dual-purpose module that offers up to 867Mbps throughput and BT 4.2 compatibility, but it's a shame the newer, faster 9260 or 9560 hasn't made the cut. Our review sample came equipped with a 128GB Intel Optane 800p supported by a 512GB Intel SSD 545s, albeit limited by its SATA interface. Other than storage, memory needs to be provided, and our unit arrived with 16GB of Kingston DDR4-3,200 SODIMMs that are far faster than the officially supported DDR4-2,400 standard. It is reasonable to assume that a fully-built Hades Canyon with Windows 10 will likely cost £1,200 or so, depending upon exact specification. A lot of that money goes towards the Intel-AMD hybrid chip located on the other side of the PCB and cooled by heavy-duty vapour chamber technology. The Core i7-8809G's CPU component uses a quad-core, octo-thread architecture that is rated at 3.1GHz base and 4.2GHz boost. 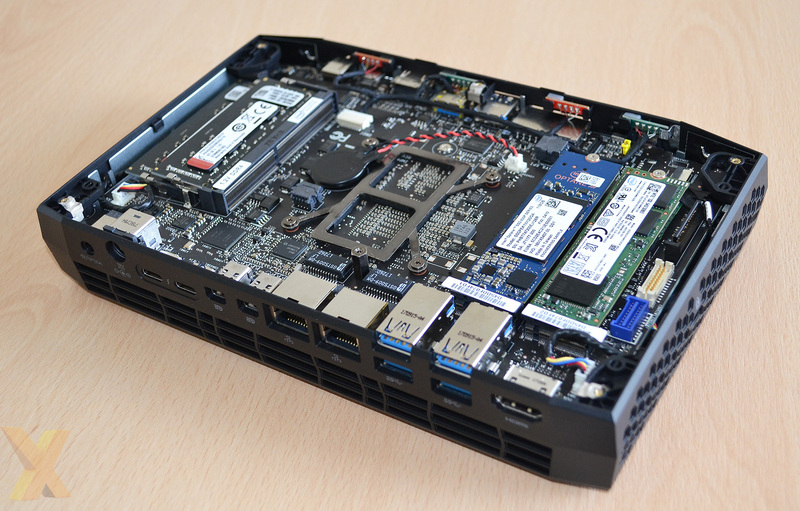 Though it is based on the decent Kaby Lake architecture, it's a shame in many ways that Intel didn't manage to shoehorn a six-core, 12-thread Coffee Lake processor instead - chances are that it may come to this NUC via a refresh. Radeon RX Vega M GH graphics are supplemented by 4GB of HBM memory, handy for saving space but potentially not great for energy efficiency. Enough preamble, on to the benchmarks.